When you have left the monkeys behind, the arrival in time is just a question of driver capability – Go India, go future! It costs just 185 Indian rupees – ca. 2.50 EUR – but it includes at least six hours full of adventure. Where do you get this offer? Very simple. 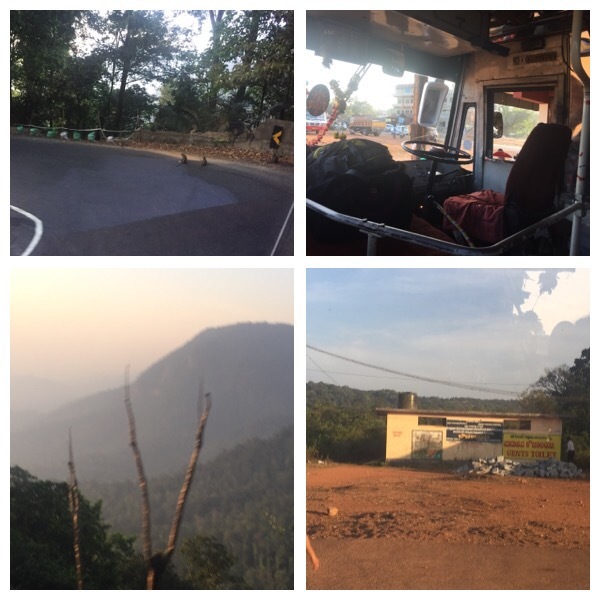 Just take a bus from Tarikere or Shimogga (a town in the state of Karnataka of India) to Mangalore. Ca. 200 km. Ok, the bus is crowdy, very crowdy. Be one of the first to get in, your reward is a ….Seat! Probably to be shared with someone else a little later, but do you really want to stand all the time? The retro mirror is there – well, at least the plastic frame, three bottles of water are under the driver’s seat – this will help to clean the front window during the break in the middle of the trip. I think it is the safest way to make sure the driver’s view. Wiping pump? Not needed. The driver’s safety zone around the seat – marked by an iron crush barrier – is a good place for bags and two travelers. I think they must have paid sonecextra for this extraordinary seat and view included. If I knew, I had taken the chance… next time. Engine started, horn working – be ready for the adventure! It’s a really nice landscape, small rivers, lakes, hills and many animals. The road is for all, that’s real inclusion. Women and men, some of farmer, cows, dogs and pigs are all on the road. Probably on their way back home. The driver greets them all by blowing the two horns continuously, two different sounds – or is it rather a hidden rhythm (or song? ), a kind of music that comes with us to Mangalore? Incredible – for that price. Then we come closer to the West Ghat mountains. Climbing up to the top and when we arrive – breaktime. You have five minutes for the toilet or to buy a drink. The horns make you run back before you can buy the bottle of water because unfortunately ten people were quicker than you and the queue is long. If you are fit enough you will be back in time, if not – hm, maybe you stay there up in the mountains for a while. In a few hours you could take the next one. Or even better: have a twenty minutes walk and reach acreally fantastic touristic panorama point. You won’t be alone: cars are parking on the left, the right, some even use the rest of the space. Don’t worry. Your driver will make it. You can smell the wheel gum, sign of freedom. If you sit close to the open door, you enjoy additionally the presence of some monkeys who might be likely to play with you. But watch out. If they get your bag, they disappear quickly … The Serpentin roads are great, in the curves there is a minimum of space. It is exciting when two bus meet. The clacson orchestra reaches its tip point. Well, after a while the excitement gets less. Before we reach the other site of the mountains you will enjoy the sunset – amazing. Really amazing. When you stuck in your romantic dreams and think of how life could be in the small village you are passing through the ambulance crosses and the people make signs of good luck. The rest of the journey? There are just some broken parts of the road which you can pass with the same earlier speed, no issue. The dust is part of the game. Hiwever, there are some small speed breaakers appearing spontaneously in the form of stoppers on the road surface and some gates put there in a way you have to go around. What I just want to say is you have to be prepaid to grab something to make sure to stay on your seat. The lightshow starts when it gets dark. I personally like the very colourful and blinky camion. Unfortunately, not all vehicles are part of the game. Some simply do not want to switch on lights – maybe they are on strike?